EDIT: The sale has now gone to 50% off everything! However lots is sold out, but I'd say it's still worth a look at in case a favourite is on offer. Hello! 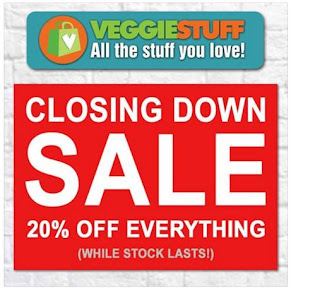 Some sad news, the great VeggieStuff.com are closing down! They were the ones who introduced me to the wonderful Schlagfix and for that I will be eternally grateful. As part of their closing down, they are having a sale. You can get 20% off everything (plus varying postage depending on what you buy). This is whilst stocks last. Once it's gone, it's gone. They sell a whole range of vegan food, including cheeses chocolates, creams, everything! This is the only branch of the brand to close, others such as VeggiePets are staying open.